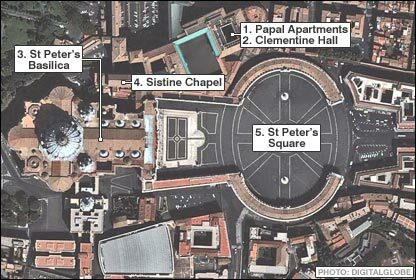 Pope John Paul II's body has arrived in St Peter's Basilica, where it is to lie in state until his funeral on Friday. Swiss Guards escorted the procession from a palatial hall in the Vatican, accompanied by many of the cardinals who will choose the Pope's successor. The first of thousands of Roman Catholics have begun filing past the Pope's body to pay their respects. The pontiff died on Saturday at the age of 84 after a 26-year reign, the third longest in history. Queues stretching back into St Peter's Square began to move slowly into the basilica when the doors were opened shortly before 2000 (1900 BST) on Monday. The basilica will remain open until Friday's funeral, closing only between 0200 and 0500 each day, for maintenance. Rome expects up to two million extra visitors coming to pay their respects. It has so far been confirmed that 22 heads of state will attend the funeral. The vast procession wound its way down ornate staircases before emerging into the sunlight of the crowded square to a tolling bell and a Latin chant, finally passing through the doors of the basilica. John Paul's body, carried by 12 pallbearers, was displayed in his papal robes and mitre clutching a set of Rosary beads. After a short religious service in the basilica, Cardinals approached the Pope's bier to bow. Church leaders, Vatican staff and prominent Italians earlier viewed the Pope's body in the Clementine Hall, with bishops and priests praying aloud as they knelt beside the Pope's remains. St Peter's Square is dotted with impromptu memorials of flowers and candles, while handwritten messages are stuck to street lamps with wax. 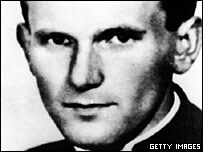 Michaela Wiemann, a German missionary among those watching the procession, said that seeing the Pope's face in death had filled her with "the joy that he radiates". "Seeing all the people here, that's the real Church," she told AFP news agency. Giant video screens may be installed to relay the ceremonies.